The mile-long beach encircling beautiful Beau Vallon Bay on the northern coast of Mahé Island is the most popular beach resort area in the Seychelles, boasting several hotels, a casino, and a selection of scuba diving and water sport centres. Beau Vallon also has a number of dive sites within the bay, including two wrecks and several coral reefs; the bay is known for its clear waters and enviable visibility. 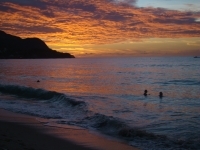 The Marine Park of Bay Ternay is also easily accessible from Beau Vallon. The bay is home to three major hotels, some of the island's oldest and most famous: Le Meridien, Fisherman's Cove; the Berjaya Beau Vallon; and the Coral Strand. There are, however, many other hotels in the area, and numerous restaurants.